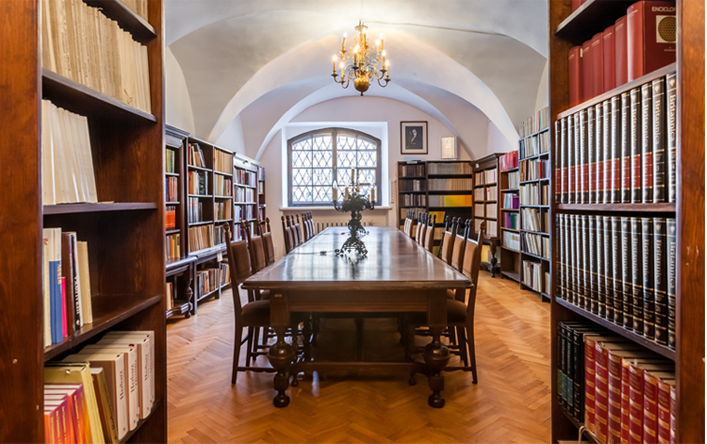 The Janusz Tazbir Library of the Institute is one of the most noted historical research libraries in the country. Its collections provide support for the research conducted by the Institute’s employees but are also open to the historians working in other institutions. The core of the library is an outstanding collection of both the printed primary sources and secondary sources for the cultural and social history of Poland as well as Eastern and Central Europe from the medieval period to the current day. It has also substantial holdings of literature and reference works useful for the research on history of social strata and various social groups, women’s history, urban history, mass migrations and totalitarian systems. The Library holds c. 40 thousand books and 21 thousand volumes of serials and periodicals, including 633 titles of foreign academic journals as well as copies of the Institute doctoral theses, books published by the Institute and written by its employees. It also participates in the book exchange system with many institutions from Poland and abroad. Since July 2008 the library participates in Warsaw Agreement of PAN’s libraries, implementing common system of automatic cataloguing Horizon. It also cooperates with the National Universal Central Catalogue (NUKAT). Since 2008, when the building of a new computer-based catalogue has started the data of older publications has been being transferred gradually from the old to the new catalogue. The employees of the Institute and the Institute of History of Warsaw University are allowed to use books either in the reading room or at home (for restricted time only). For all other persons it is a reference library. Letter of recommendation is required from the students who want to access the collection. In 2017 the Library was named after Professor Janusz Tazbir deceased in 2016.